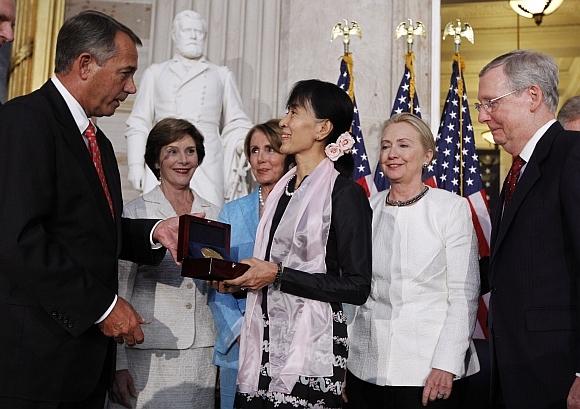 Visiting Myanmar's opposition leader Aung San Suu Kyi has received prestigious Congressional Gold Medal, a rare honour bestowed to any foreign leader by the United States administration. The National League for Democracy leader also met President Barack Obama on a day when the US lifted additional sanctions on Myanmar. "This is one of the most moving days of my life, to be here in a house undivided, a house joined together to welcome a stranger from a distant land. 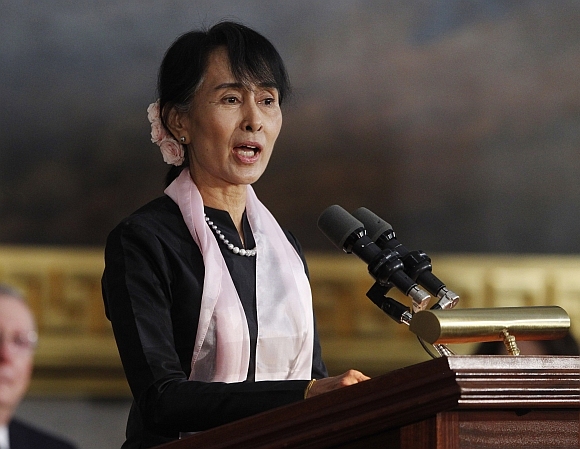 This is a moment for which I have been waiting for many years," Suu Kyi said moments after receiving the honour. 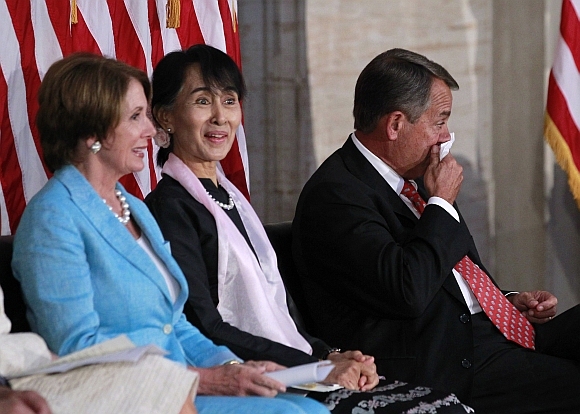 An emotional Suu Kyi also addressed a gathering of top American lawmakers, in which Secretary of State Hillary Clinton and former First Lady Laura Bush was present. 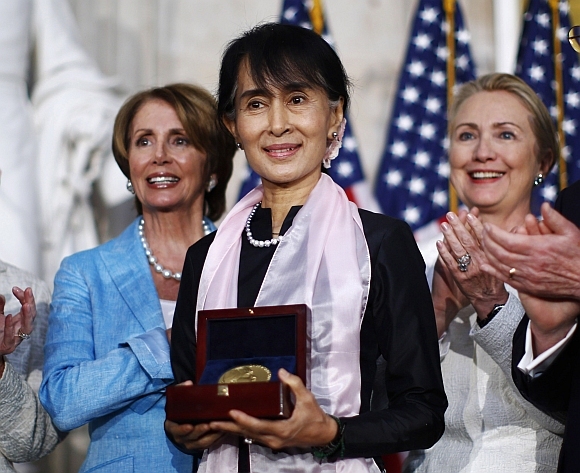 In her Congressional Gold Medal acceptance speech Suu Kyi said it has always been her opinion that democracy offers the best balance between freedom and security for all of them. "To be a full human being, we need both security and freedom. Without security, we cannot rest in peace necessary to discover the world to be the beautiful place that it can be. Without freedom we will be deprived of the opportunities that will make us more human and more humane," she said. Aung Min, representative from president of Myanmar, and country's new ambassador Than Swe were also present at the ceremony. "It's almost too delicious to believe, my friend, that you are here in the Rotunda of our great Capitol, the centerpiece of our democracy as an elected member of your parliament, as the leader of the political opposition, the leader of a political party," Clinton said in her remarks on the occasion. "I am so deeply moved by what she has stood for and what she has represented, first and foremost for the people of her country, but for people everywhere who yearn for freedom, whose voices deserve to be heard," she said. Terming her 'an advocate, a symbol and an icon' Clinton praised Suu Kyi for not getting 'satisfied' upon her release from house arrest. 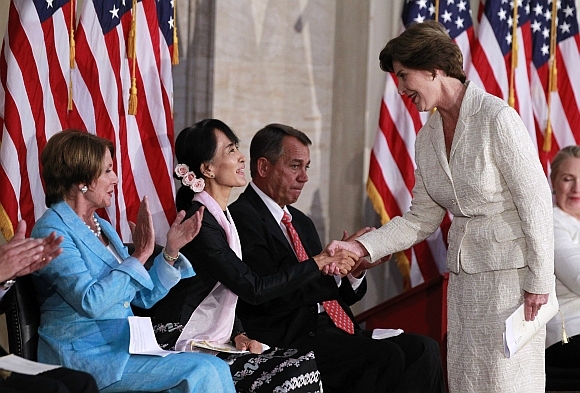 Laura Bush, who had been a supporter of Suu Kyi and her efforts during the previous Bush Administration, said that the transition in Myanmar, like past events in South Africa or Eastern Europe, shows that history has a hopeful direction. "It's capable of miracles. There is a part of every soul that longs for freedom. And any government built on oppression is built on sand," she said. One of the most repressive governments on earth attempted to isolate and silence one woman. It must have seemed an easy task. Instead, the regime encountered an immovable object and its legitimacy broke against here character," Bush said. 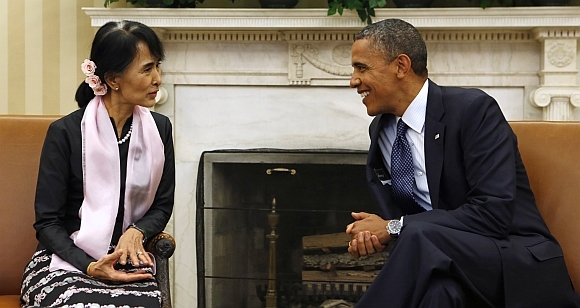 Suu Kyi later had her first face to face meeting with Obama, during which the US president welcomed democratic transition in Myanmar, the White House said. "The President reaffirmed the determination of the US to support their sustained efforts to promote political and economic reforms and to ensure full protection of the fundamental rights of the people of Myanmar," it said. In the meeting, Obama expressed his conviction that the ongoing process of reconciliation and reform will offer people of that nation an opportunity to take charge of their destiny and to shape a more peaceful, free, and prosperous future. Earlier in the day, the Obama Administration lifted sanctions against the Myanmar President Thein Sein and Lower House of Parliament Speaker Thura Shwe Mann by removing their names from the list of Specially Designated Nationals. This provides them access to property and assets and allows them to carry transactions involving US persons or in the United States, the department of treasury said. "Thein Sein and Thura Shwe Mann have taken concrete steps to promote political reforms and human rights, and to move Burma away from repression and dictatorship toward democracy and freedom, warranting today's delisting action," said Under Secretary of Treasury David S Cohen. Ever since Thein Sein took office as president in 2011, he has supported far-reaching reforms in the country, and besides maintaining a dialogue with Suu Kyi, has granted amnesty to hundreds of political prisoners and overseen elections in which she and other NLD members won seats in parliament, Cohen said.